Here we’ll be looking at Google AdWords, Google’s own advertising service which allows you to place search results for your website on a search engine results page (SERP) by paying for them. There’s no need to wait for your new site to work its way organically up the rankings. By using paid search you can see immediate results and it’s not nearly as difficult to use or expensive as you may think. Paid search is the term we use for advertising within the listings of a search engine. 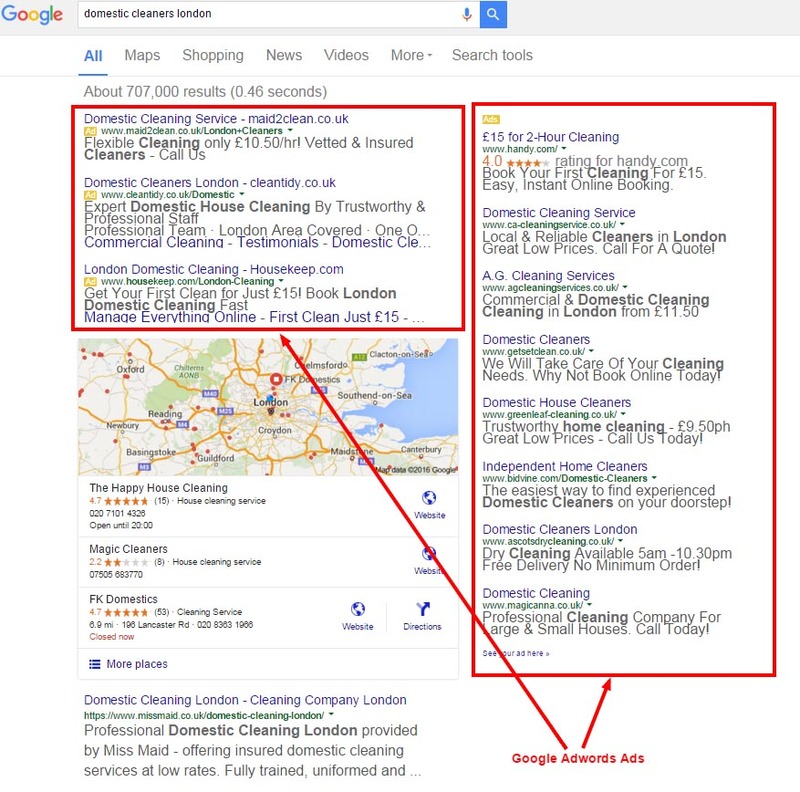 These normally appear at the top of a SERP or to the side, and increasingly look more and more like organic results. At the moment Google places a small yellow ‘Ad’ label on them. The search engines isn’t the only search engine where one can do this, Yahoo and Bing also run their unique advertising network, called the Aol Bing Network. For now let’s take a look in Google AdWords. Keyword is a word or phrase(typically a phrase of two or three words) which has been identified as one which potential customers use when they are searching the internet. Basically you pick some keywords which a searcher might use on the search engines, then create an advert that could appear on the SERP according to those keywords, such as in the above esample: "domestic cleaners london"
If you want your ad to appear at all, you have to bid against other marketers on how much you’re willing to pay Google AdWords every time a searcher clicks on your ad. Obviously the more you pay-per-click (PPC) the more likely your ad will appear in the search results.